Hi there! 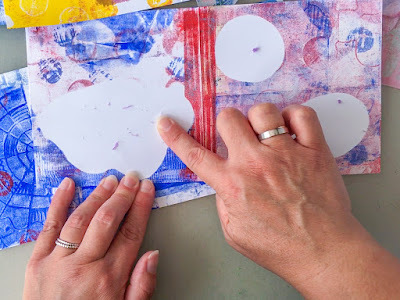 It’s Marsha here with another summer gel printing project, This project is super fun to do with kids! 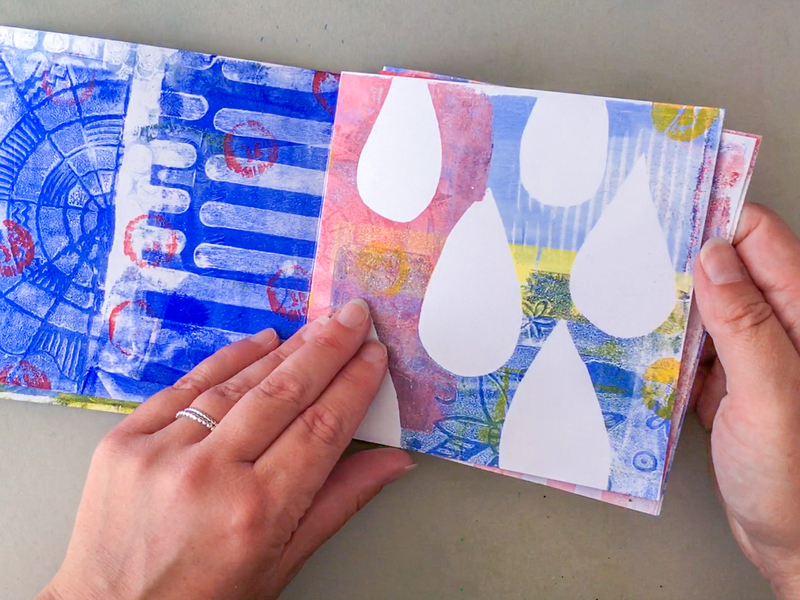 GelliArts® DIY Printing Kits are perfect for taking with you on a summer trip or a weekend getaway. 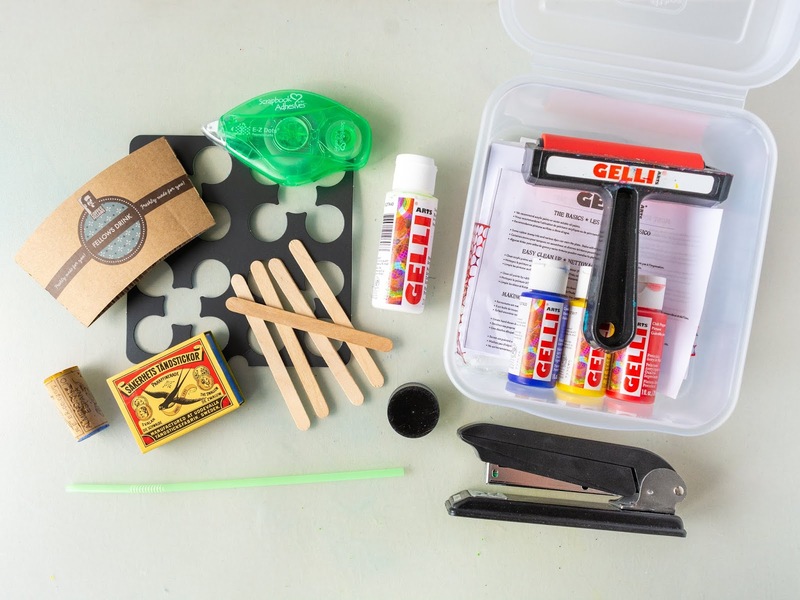 They come in a sturdy little container and include everything you need for a gel printing session. For this art-on-the-go project, I chose to work with the Card Printing Kit. 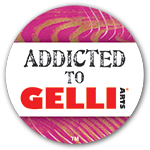 It contains a 5”x5” Gelli Arts® gel printing plate, three bottles of Gelli Arts® Premium Acrylic Paint, a 4” roller, five 5”x5” blank cards, two 4.5”x6” foam sheets, twelve sheets of 5”x5” parchment paper, bubble wrap, yarn and punchinella. In addition to the kit, I used a bottle of Snowbound Gelli Arts® Premium AcrylicPaint, a stapler, and a tape runner with repositionable adhesive. I also used found objects like popsicle sticks, a coffee cup sleeve, a drinking straw, a lid, the cork from a wine bottle, a matchbox and packaging material as mark makers. 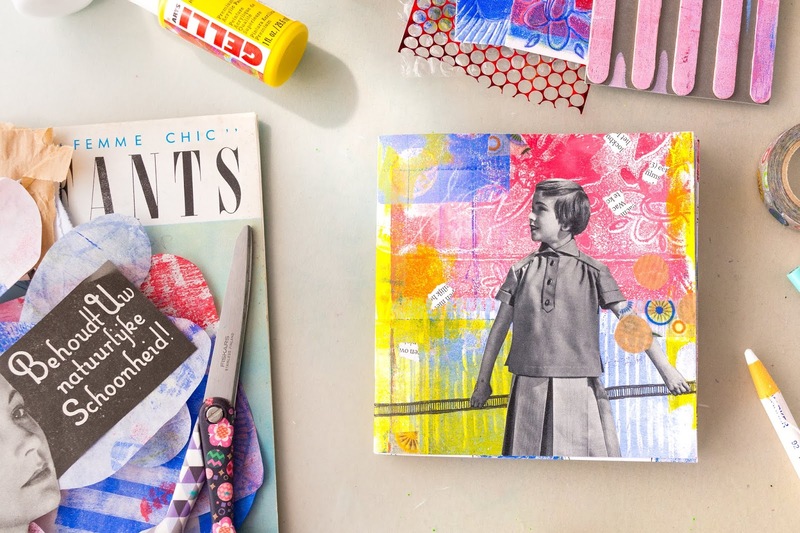 To finish my pages, I used newspaper, a small paper bag and clippings from (Fifties) magazines as collage material. 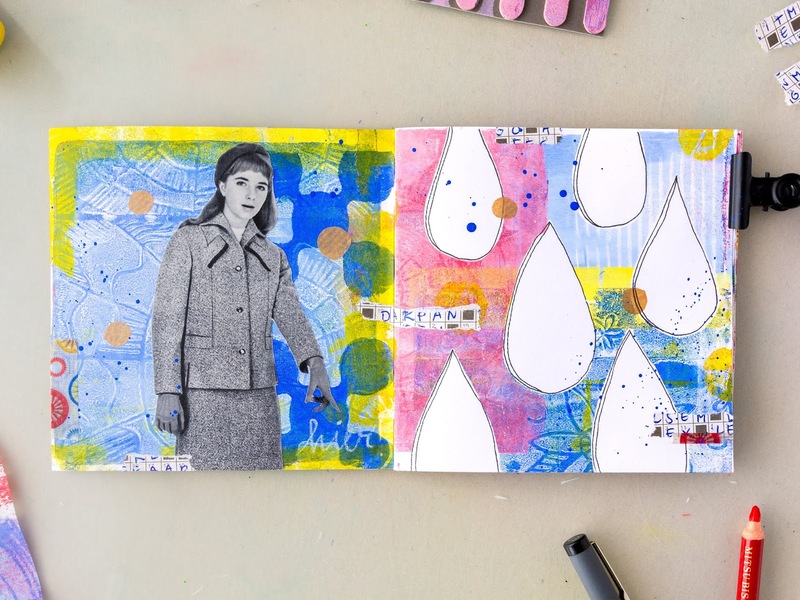 I also used a couple of supplies that I carry with me in a pouch for art-on-the go, like a ballpoint pen, a black fineliner, scissors, adhesive, washi tape and a couple of crayons and markers. Create a couple of texture plates. 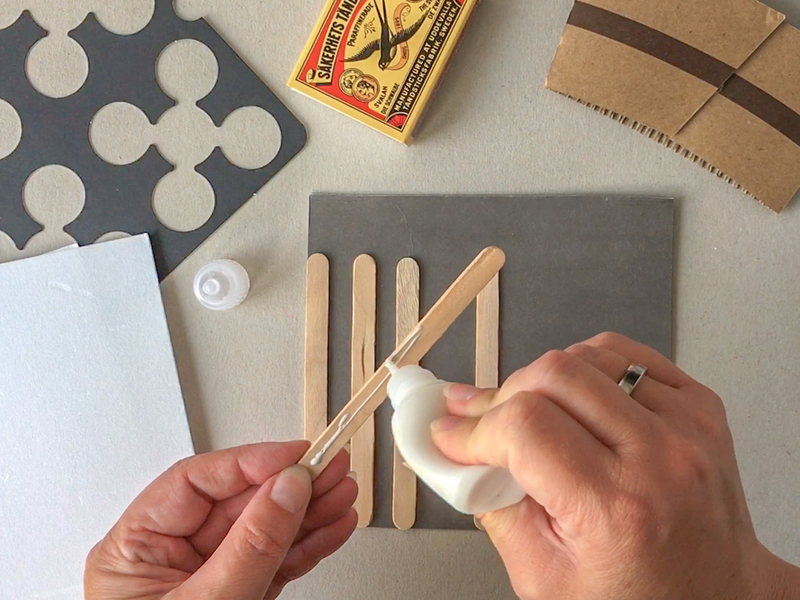 Glue popsicle sticks to a scrap piece of cardboard. Use a ballpoint pen to draw fun designs on the foam sheets that come with the kit. Make sure that you press the ballpoint pen firmly into the foam and retrace each line to create a nice dent. Cut a couple of paper masks. You can use the parchment paper that comes with the kit or just plain printer paper. 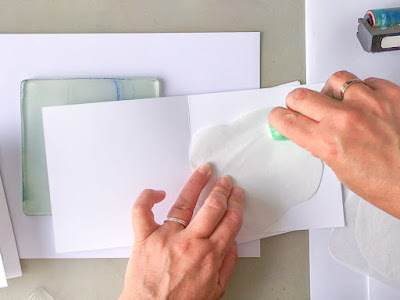 Take the 5”x5” blank cards and adhere the masks to the cards using temporary adhesive. I adhered one mask or one group of masks to each side of four cards and kept one card aside for the cover. 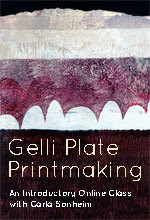 Place your Gelli Arts® gel printing plate on a smooth flat surface and start printing! 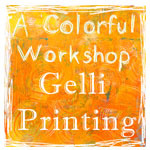 Roll a drop (or two) of acrylic paint onto the Gelli Arts® gel printing plate with the roller. 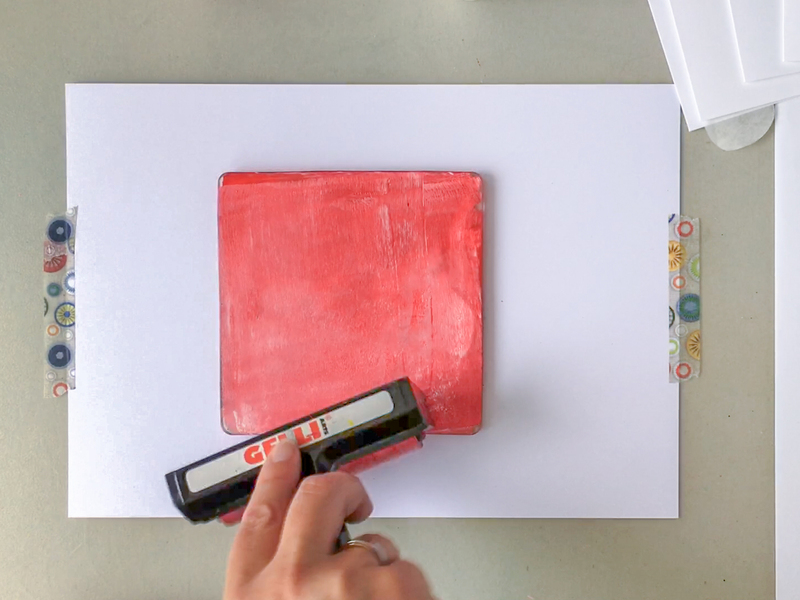 Press the mark making tool of your choice into the paint. Take a blank card and pull a print. 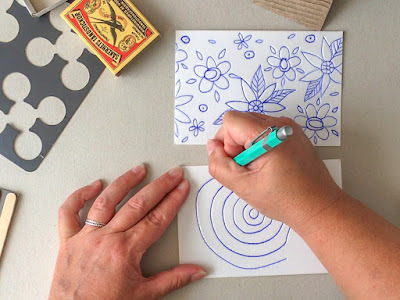 Repeat each pattern on a couple of cards. This, together with the limited color palette, will make the mini book look cohesive. To achieve the repetition of color and pattern, I cover the plate with a couple of cards at the same time, or I pull a partial print on one card and then proceed to the next one until all of the paint on the plate is gone. 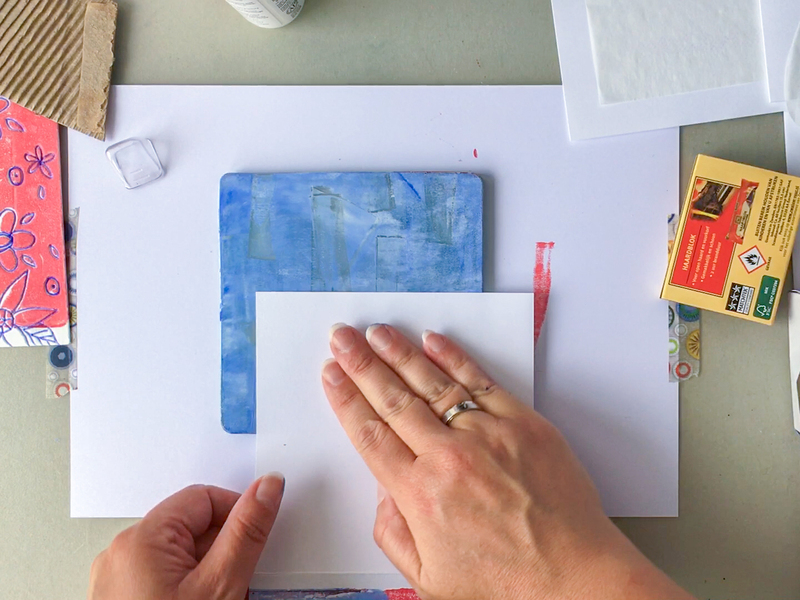 If one of your hand-cut masks sticks to the plate just re-adhere it to the card in the same position it was before. 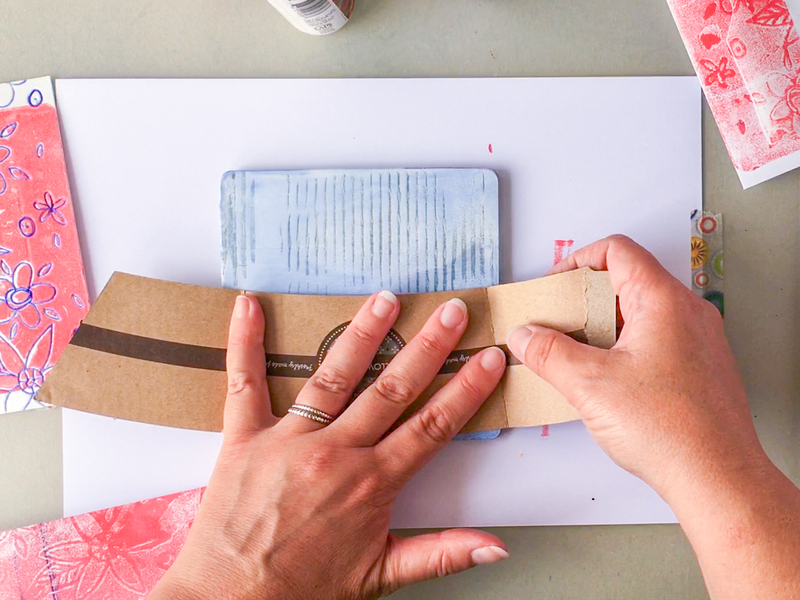 Print until all of your cards are covered, and you are happy with the results! 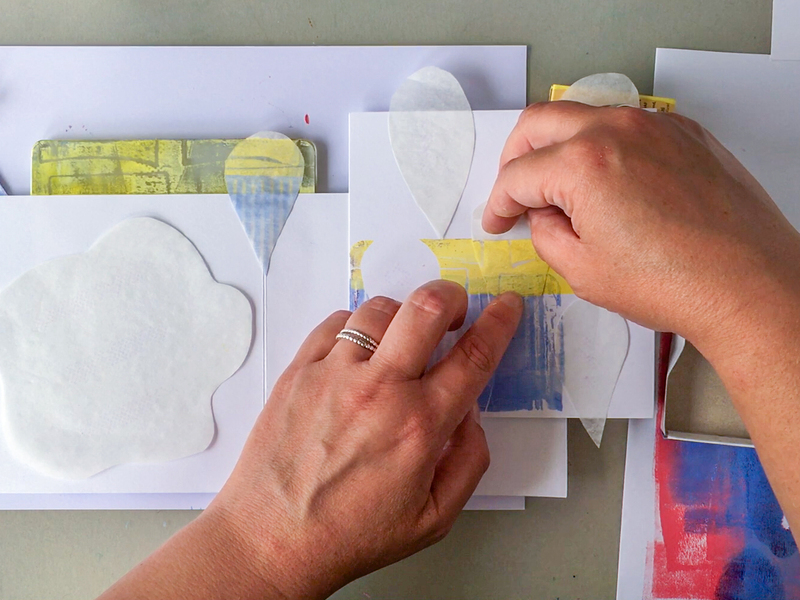 Lift the masks off the cards and remove the all of the adhesive residue. Assemble your booklet. 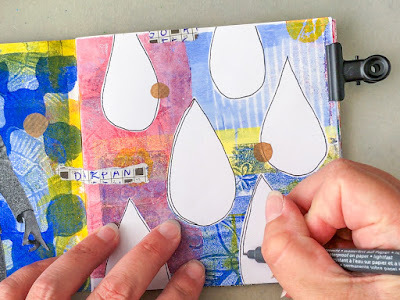 Start with the cover, arrange the pages and decide on which order you like. 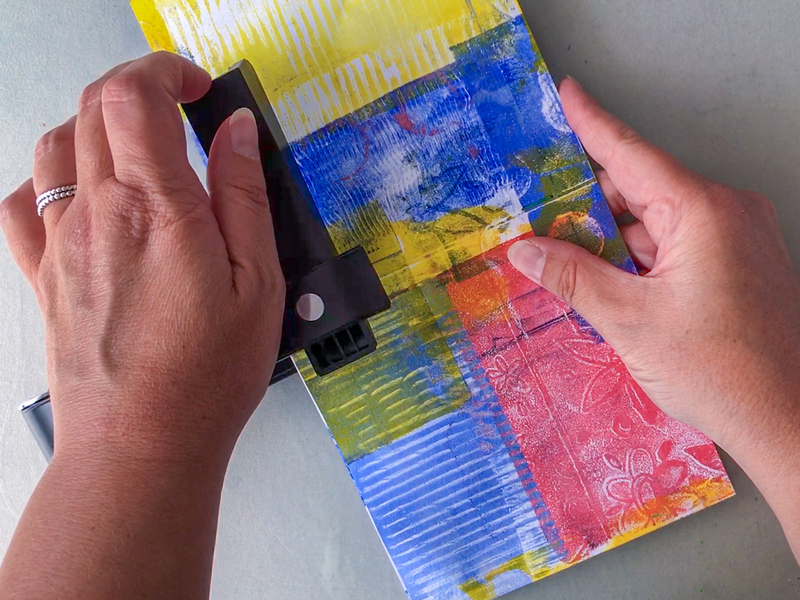 Staple the spine or use your favorite bookbinding method instead. 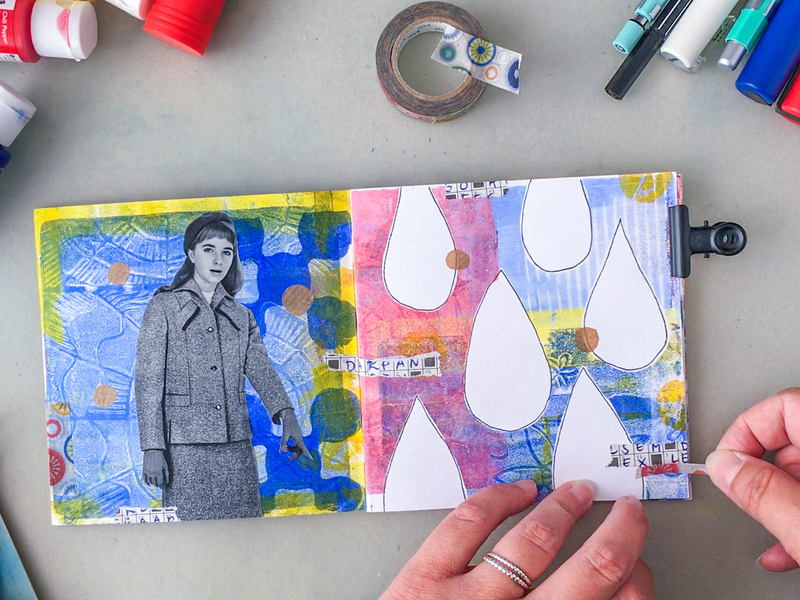 Now you can dress up the mini book in any way you like. 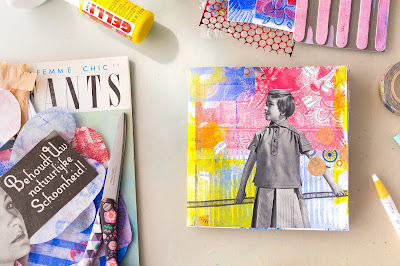 Doodle, collage, add washi tape (or stickers), make marks, scribble and splatter. Use it as a sketchbook, art journal, travel journal, scrapbook, a book of hand-lettered quotes, or a summer bucket list. The possibilities are endless! Don’t forget to share your mini books with us. We would love to see them! What fun and a quick, satisfying project.... thanks. I'm interested in the stapler that looks like it adjusts to accommodate larger size paper. What kind is it? Hi! Look for a swivel stapler or stapler with swivel arm!